I am very excited to be off to Israel to attend Yossi Vardi's Kinnernet event and speak about user generated content on a panel entitled "The New New Media" for the Haartez Internet Conference. Looking forward to hanging with friends and checking out the current Israeli Internet scene. Also hope to get some good falafel and find time for some horsebackriding at Vered Hagalil as well. Unless you have been hiding under a rock the past few months, you know that on-line video has taken off and is poised to really have an interesting impact on digital entertainment across the board. It is a fun, chaotic, exciting universe. SO much going on so quickly that it is all a bit confusing and overwhelming for the average user. I have been advising Mary Hodder and her team at dabble.com for the past few months, and had a blast working with my friends Emily & Max over at Ideacodes (web 2.0 design dynamic duo) and Heather Gold (aka video diva). It's super exciting to see everyone's hard work revealed. There is a lot of cool stuff about dabble - but for me the really neat thing is that it sits on top of the ever expanding world of on-line video sites. It acts as a simple entree point into all the videos on the web while also connecting you to the people who create them and their fan base. In shorthand - think of it as Google meets Flickr for video. So, go sign up for the beta and check it out. For those if you still confused about all this social networking, tagging, bookmarking stuff - It is a great example of the new web universe - aka "Web 2.0" or the "Live Web". Also make sure to check out this week's Newsweek cover story for a good entree. As someone whose job title (for lack of anything more accurate) has often labeled me as a Marketer, I have lived with a constant frustration due to the lack of understanding of what it is that marketing folks actually do. Additionally, I have always hated the term "marketeer". Who the heck came up with that inane disneyism anyway? I am not a cheerleader. I am first and foremost a communicator and connector. I have always considered myself a stand-in for the customer. A good marketing professional connects the product to the customer, the customer to the product and now the customer's to each other. I jumped onto the cluetrain way back in the day because it gets back to the fundamental basics and reminds companies that they need to RESPECT their customers. The role of the marketer is a dirty word when it was about hucksterism and hype --this is not the kind of marketing I want to associate with and thankfully never had. Seth talks about not trusting marketers, and I agree that it is not a surprising outcome of poor marketing, but it is such an EXCITING time to be in marketing. FINALLY the power is shifting back to the customer and and forcing companies to realize that today's marketing is fundamentally about listening, communicating and most importantly FACILITATING. I have SO much more to say on this, and I can't wait to hear what Doc has to say, but for now, I tip my hat to Tara Hunt . She is doing a great job this week articulating what is going on and jump starting the conversation (check out the wiki). Tara - I am not sure about that 'pinkomarketing' theme as it conjures up images of bad 1950's TV for me -- but who cares, I am 200% behind the concepts. You go girl! Jut wanted to say thanks to everyone who showed concern over the eye mishap. 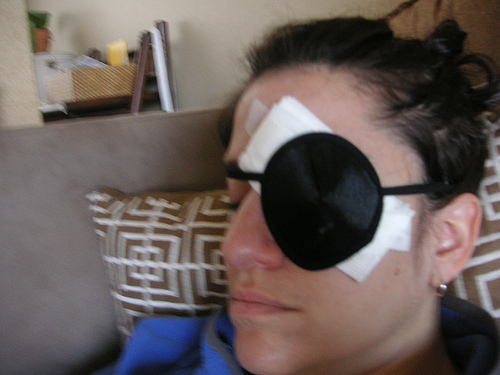 Suffice it to say you do NOT want to ever scratch your cornea - it hurts. Thankfully, I am all better now! I have been out and about alot in the past month and many new folks that I have met keep wondering where the new posts are. Well, I should NOT make excuses, but...this photo should explain why I am a bit behind. It looks worse than it was, but not having full site, really put me back on the work front. As of this week, I have a clean bill of health and can see again. I will never take my eyesight for granted again. Thanks for all the well wishes. Will be catching up on posts ASAP.